Okay it is Sunday and I have a chanced to get out for a couple hours and I am going to take the chance. But as I have not been able to get out as much I have been spending more time on Facebook and I have noticed a few things I would like to share, just my thoughts and nothing more. Now before I get started I don’t care what side of the political spectrum you are on as we all have the right to believe and support who we want and that will not change who is my friends. I have not and will not unfriend someone who believes different then I do or treat them bad. Now I have snoozed some friends for 30 day if and only if they are posting multiple negative things about other people mainly the people who believe or support someone they dislike. Now Facebook can be a wonderful thing as it brings all kinds of people from all over the world together. The bad thing is we can post things without seeing the other person or side. Now I will tell you there is nothing you can post on your Facebook page that will make me suddenly change from my beliefs or political views simply because I saw them on your page and I would hope the same is true of you as I would hope that you put your support in something or someone you truly believe in. so for that reason posting this type of stuff on our Facebook pages only polarizes people and divides our country. The second thing and this is the biggest is almost half the country is on the Democrat side and almost half the country is on the Republican side with a small amount who don’t like or care about either. So, when you post negative things about the other side or more specifically the people who support the other side remember at least some (up to half) your friends are the people you are talking about, the ones you are calling names. I have some friends that post a lot of political stuff that have 3,000, 4,000 and even 5,000 friends and I can assure you some of them disagree with you. I only bring this up as I have one friends who posts a lot of negative stuff about the other side and the people who support them and she was actually shocked that some of her friends unfriended her for voicing her political views. Well I can say they probably did not unfriend you for that but rather the things you posted about how bad they were for their view. Now this is as close as I will get to a political statement on my blog. Please think about what you are posting before you post it. Imagine how you would feel if someone posted that about you. Facebook has taken away the personal contact on things like that. As I said I will not unfriend anyone over their views as you have the right to them just like I do. Please show respect for all your friends. Okay this conclude my political statement and now back to our scheduled blog. As I said I had a few hours free and wanted to get a little Susan time in for two reasons, One I really miss my Susan time but two I wanted to try a new makeup. I had seen a video on Maybelline super stay full coverage 24hr foundation. The videos looked like it worked really well and it is about a 1/3 the cost of the MAC foundation I currently use and available in any store that sells makeup. I was also interested in trying the Beauty blender Sponge applicator. I have a couple foundation brushes but never really likes the way the foundation looked using them so I always go back to putting on my foundation with my fingers. If you are interested in them you can find many videos on YouTube about them. So yesterday when I was at the store in my male mode I bought both to try. So, with my new items today was the chance to try them. Now first the Beauty Blender sponge did seem to work really well and gave me a really nice coverage and I used less foundation then I usually do with my fingers, I was impressed. The Super stay foundation also seemed to work really well and covered up well, also so far impressed although the full test to see how it looks later on when I am done for the day and ready to remove it as most foundations look good when you have just put them on. It was a little after 4 when I was ready and as I said with my parents I really don’t want to go to far from home so once again it will be close, I think I will do the same as last Sunday. Hit the Starbucks by my house for an hour or so before going to Subway for something to eat and then finish up at the other Starbucks by the Subway. 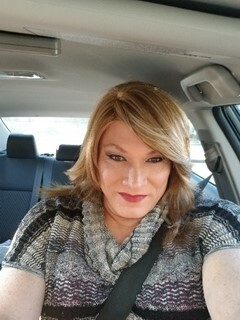 Now I didn’t get to the Subway this week but I did go to the other Starbucks last night as my male self for about an hour so it will be interesting tonight when I go there as Susan. I got to the Starbucks by my house about 4:15 and they were not busy but it wasn’t long and people came in. soon most of the tables were full and there was always a line of people ordering and waiting for there drinks. It was good for people watching. I stayed here till about 5:15 before going to Subway for dinner. I got to Subway and there was only one person in there getting a sandwich a head of me so I only had to wait a short time. The same girl who waited on me late week was here again. I got my sandwich and sat do to eat it. I was here about 30 minutes and no one else came in. for between 5 and 6 pm not very busy. I got to the Starbucks where I have been going as my male self and went in. also not real busy as this one has a drive through. 2 teenage girls and 1 young man. I went up and ordered my drink, a hot chocolate as it is a little cooler today and I have a free drink reward. Now the same lady who was here yesterday and waited on me was the one I ordered from today. There was no sign of recognition from her but one can never really tell. I went over and sat at the same table I sat at last night and got out my computer. Now the lady who took my drink order actually brought it to me at the table which was nice. I must say I have gone to many Starbucks as Susan and have always been treated wonderful at all of them. Now I had only been sitting a few minutes and 5 other people came in as a group, turns out they were meeting the young man who was already here so now there was more people inside which is nice as part of the reason I like going out as Susan is to interact with other people even if not talking with them at least being around them. Now this group really paid no attention to me but I did notice a couple times the 2 teenage girls looking at me. Soon they left though and it was just me and the other big group. I stayed here till 8 before going home. Okay I got home and the new foundation held up really well, the only problem was the shade I picked. I went a little darker called warm sun, just a little darker than the one I was going to get. In the house it looked fine but in the daylight it kind of looked a little orange. I guess I will have to try a lighter color. It was still a relaxing couple hours. Thanks for reading and be sure a see my most recent blog. Okay it is Sunday afternoon and I have a little free time and so I am taking the opportunity to be Susan but staying close to home so that means Starbucks b y my house. I got home from my parents around 2 and started getting ready. My dad is doing good today and I am hoping I won’t get a call this evening but reason to stay close to home. I got all ready and was at Starbucks by 3:30. They were not busy when I got there but it would not be that way long. I ordered my drink and sat down with my computer. The first order of business was to write my blog from last night, yes I actually went to the Escape for a few hours. It was so relaxing to be out again. I really can’t plan these outing right now, so I must take advantage when they come along and enjoy them. Now my plan was to stay here till they close as long as everything goes okay. Now they close at 7 so that would be almost 4 hours which I have done many times. It is amazing how you don’t notice time pass when you are busy doing things on your computer. Having a laptop, you can take places and do things with really can open the world for you as you don’t have to be at your desk to do things. I got my blog done and caught up on some e-mails and checked some friend’s status on Facebook. It was just a relaxing day playing on my computer and people watching. I stayed here till 5:30 and then I decided I was hungry and wanted something to eat. I decided to go to Subway. Now this is a big step as I go here a lot as my male self, but they do have a turnover of staff. I think I did come here once before as Susan and get a sub to go. I got there and went in and there were several people in line getting sandwiches, so I got in line and waited my turn. There was no one eating here though as everyone was getting them to go. Soon it was my turn and the lady who helped me is the same lady who has helped me the last 2 time I have come here as my male self, last time was 3 days ago. I ordered my usual although I did make an effort to speak softer. She appeared to not recognize me. I got a drink and chips and when she asked for here or to go I said for here. She put it in a basket and I went and sat down to eat. Now wouldn’t you know it the next 3 groups also got there for here so there were several of us now eating here but that was okay. People came and went as I ate and I didn’t know any of them which is always a concern when I am close to home. It was about 6:30 when I finished and wondered what to do next as I was really enjoying my time as Susan but the Starbucks by my house closes at 7 and there really wasn’t time to go back there. Now as I said I don’t go to the same places as both Susan and my male self except for Subway now. So now a little side note. As I have not been able to get out as Susan what I have been doing is wearing my sandals more, so my red toenails are visible. So, there is another Starbucks 2 block the other side of Subway and only about a ½ mile from my house and yes, I have gone here 3 or 4 times in the last 2 weeks as my male self with my computer and my pretty toes showing and no one has noticed or said anything and they are open trill 8 so I decided that was where I was going. It’s a little bigger but seems less busy inside as they have a drive through. I parked and went in and there were about 9 people inside at tables, but they have about 14 tables and a counter so plenty of open seats. I went to order my drink and 3 of the ladies here tonight have been here every time I have been in. I went to the counter and the lady who took my order was the same one who waited on me on Friday night. Again, no indication she recognized me but then it has only been a few times I have been here, not like being a regular. I got my drink and sat down at the table and spent some time on my computer. Now I really do like the Starbucks closer to my house as I have been going there for a long time and they all know me by name but I am thinking now that it might be fun to come here as my male self and then as Susan and keep switching back and forth and see if or how long it takes them to figure it out. Of course, it is always possible they could figure it out but never say something, but I will have to give this some thought. I stayed here till they closed at 8 and then stopped at the gas station right next door as I needed gas before heading home. It really was a relaxing afternoon. Not sure when I will get out next, but I am sure it will be a spur of the moment opportunity as I have family coming back into town the next couple week and not sure how that will affect things. Thanks for reading and be sure and see what’s new when I get a chance on my most recent blog. Okay it has in fact been 4 weeks since I have had any Susan time and I am really missing it. It is so hard when you are use to going out 2 to 3 times a week to just stop. Now I did get a chance to get together with a few of my friends, but I was in male mode and I also got together one evening with Julie for a couple hours again in male mode, thanks so much Julie I had a wonderful time and it was so great to spend a few hours with you. I miss my friends as much if not more than my Susan time. A few years ago, I would never have shown up as my male self, but I have such wonderful friends now I am willing to let them know all sides of me. Now my big concern is the fact my family does not know about Susan. I have had to leave work a few times and been waken up in the middle of the night to run over there, usually for a medical reason but when I am Susan it adds that issue of having to change before going over. So, if I am out someplace and something comes up I must run home and clean up and remove all traces of Susan before going over and that ads time. In case I didn’t say it in my previous blog my dad is now on Home Hospice, so I am constantly waiting for that call. The good news is there is not a definite diagnosis, but he has enough health issues that they figure it is short term as in less than 6 months. I have thought a lot about it and I think I am going to try to get out to Starbucks by my house as if something comes up I can be home in just a couple minutes, so I should be able to get over to their place within 20 to 30 minutes. Well tonight I decided to go out to the Escape as I wanted to see some of my friends. I posted I would be there in our group but in reality, I have no idea is anyone will be there as it has been a while since I was there, but I was hoping. Now I did start getting ready early about 3:30 as I wanted to take my time and yes it would take longer as I have let some things go over the last few weeks. Plus, not doing my makeup for that long I was sure I would be slower. Well it is like riding a bike, you don’t forget you just need a little longer. It was about 5:30 when I was ready and on my way. Now the Escape is not bad as it is only 20 minutes away so not that far and, on a Saturday, there shouldn’t be traffic. Now some things don’t change as I got in my car in the garage and opened the door and drove out, didn’t even think to look outside to see if any of my neighbors were out. As I was getting ready I wondered if I would have some jitters about going out after so long, but I didn’t. I guess Susan is just a normal part of me. Now don’t get me wrong I am not going around and telling people about Susan but I have come to the conclusion that if they find out they find out which is a wonderful place to be. I got to the Escape a little before 6 and of course I had to take a quick selfie before going in to remember tonight. I thought my makeup turned out really well and I got to wear my new lipstick. I actually bought this almost 4 weeks ago and have not had the opportunity to wear it. I went inside, and they were a little busy about 15 people almost all sitting around the bar, so I sat down at our table. And got my computer out and then went up and ordered my dinner. I got back to the table and a man came over and sat down and talked with me. I have met him here before, he knows Samantha and Cloey. So, we talked for a while and he asked me if I have seen them lately which I haven’t. I think Cloey still lives local, but Samantha moved out of state. Any way we talked for a while before he went back and joined the people he was with. My food showed up, so I put my computer way while I ate. After I finished I got out my computer and was getting ready to do some things when Bobbie showed up so at least I wouldn’t be here by myself tonight. We talked for a little bit while I also did a few things on my computer which I needed to do including posting my blog from getting my manicure in male mode last night. Now I will say typing on my key board with no nails feels funny, as I said when I got my manicure last night she trimmed them way down and rounded them off, totally different feeling then I am used to. A little later Laura H, and Max showed up then Laura M, and her girlfriend, Britney and her friend and then Jan & Lynn and one other girl from our group so it looks like we will have a good turnout tonight. Now it still was not very busy, and our group was close to half the people here at least for now, it would not stay that way. It was so nice to talk with some of my friends and spend time with them. I really do miss seeing them. By time for Karaoke it got busy and soon it was standing room only, so it was good we had our table. Now Karaoke is fun to listen to but makes it hard to talk but I was able to chat with my friends some and that was good. It was about 10 when Lauri showed up, so it was a fun night. I stayed till a little after 10:30 before calling it a night. It really was a wonderful night and went by so fast as they always do. It really was sad to see it come to an end but as I said I am going to try to get out to Starbucks at least for an hour or 2 every week and if he is doing well tomorrow I will be at Starbucks. I even thought about going to the nail salon as it is close to home but I think that will have to wait as at Starbucks I can leave immediately and head home little more difficult in the middle of a pedicure or getting my nails done. It has been 4 weeks since I have been able to be Susan and I am really missing it, I really need to find a way to get at least a little time for Susan. As you all know family matters have come up and limited my ability to get out. I even had to remove my acrylic nails which I have had for 16 months. Well they were really looking bad, so I decided Friday I would go and get a manicure and see if I could get them looking better, of course it would be as my male self, so I didn’t want to go to Dream Nails as they only know me as Susan. Well I decided to go to Creative nails off Mill Plain as I have gone here once before a couple years ago and they did a really nice job. Now I didn’t make an appointment like I do as Susan I just showed up a little a little after 6. They were not busy just one lady getting a pedicure and only 2 ladies working. The one lady asked if she could help me and I said I wanted to get a manicure. I sat down, and she noticed the little acrylic I still had on my nails and asked if I wanted them redone. I really wanted to say yes but said no just a manicure, so she took the time to remove what little acrylic I still had on my nails. Now what I remember about this nails salon is they do everything by hand. No drill files or grinders all hand filing. Now it was so relaxing getting my manicure and as she did my nails we talked. She asked me where I lived, and I told her which is about 10 miles away, I told her I was down this way visiting a friend and just needed a manicure, so I stopped in. to my surprise she remembered I had been here before a couple years back. Now I am use to being remembered as Susan as I kind of stand out little different as my male self. She did a wonderful job and my nails looked way better but nowhere as nice as when I had acrylics. It was still a relaxing 30 minutes and really made me wish I was here as Susan. Now what is funny is my nails and fingers still feel funny without my acrylic nails. It has been a couple weeks and I am still trying to get use to short nails. I never had this much trouble adjusting to the longer nails when I got them done. I also notice they break easy probably do to the process of having acrylics put on as they file off the top layer which is the hardest layer of your nails. It may be hard, but I think I will wait at least a month before getting acrylics again just to give my nails a chance to recover. They have grown out half the nail bed now yes with the clear polish on you can see the line on my nails if you get a close look. I am still waiting for someone at work to say something about my short plain nails but then again in a year in a half I only had a coupe people say anything about my nails with the acrylic. it is funny though as one of the ladies I work with always comes and shows me her nails after she gets them done and right now she has beautiful long nails with different colored tip, I really am jealous of her nails. Well thanks for reading this update and I am planning on getting out for a couple hours Saturday night if I can. It has been a while since I posted and yes since I have had a chance to be Susan. Life has gotten complicated with my parent’s health and as such I am not able to go out right now, keep hoping for a couple hours here or there but so far not happening. I had to remove my acrylic nails I have had for 16 months as I was unable to get the time to go in and have them done and after 4 weeks growth they were looking bad. I really do miss them and my fingers feel so different. I also had to cancel my Mexican cruise which was so sad as I was so looking forward to it. I really hope our group does it again in the future. I still do check my e-mail, our group and my Facebook page although not as often so I do keep up with friends. I am not sure when I will get out again but I think about it often. I am sure one of the first things will be to get my nails done again. I may not post much for the foreseeable future but trust me I am still here in spirit.